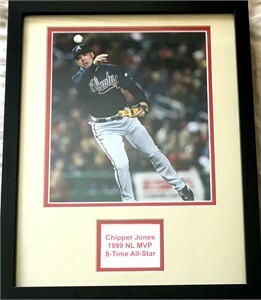 8x10 action photo of Chipper Jones double matted in red and beige to 11x14 inches, framed with glass in black, ready to hang. NOT AUTOGRAPHED. ONLY ONE AVAILABLE FOR SALE.